Order Dark Harbor on Amazon.com. During the final sail of the season, lightning disables Nora Perry’s boat. In search of a phone, she and Hendrick van Pelt (Van) find the decaying body of a colleague in his Queenstown harbor home. Drawn into the investigation by a favorite student, Nora enlists Van. Their experiences as sailors and as academics are invaluable in the pursuit of what happened to their colleague. The willful, redheaded psychologist and her formal, physicist sailing companion discover the shadowy, dark side of the dead man. Ted Slater had a twisted life and had bent people to his will for years–until someone realized that his death would buy them freedom. Motives and suspects abound: students, colleagues, lovers, and wives. How will they ever discover who the real killer is? The attraction between Nora and Van is complicated. She’s nine years older and she outranks him. He’s bruised by divorce. And Nora’s personal history with Capt. Frank Pierce intensifies tensions created by amateurs meddling in police business. Will personal issues undermine the investigation? 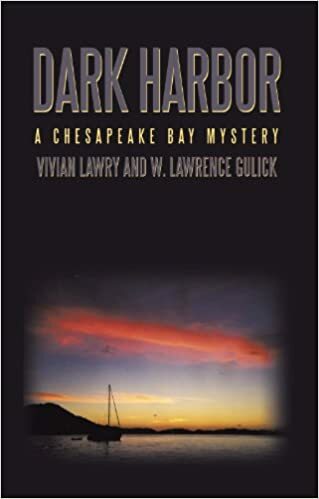 Dark Harbor is the story of intrigue, love, and death in the beautiful setting of the Chesapeake Bay!